"Well, it looks like the perfect ending." Other Stars: Richard Kiel, Monte Markham, William Schallert, Gary Springer, Gordon Jump, Rick Nelson, Bob Crane, A Martinez, Beverly Garland, Robert Englund, Jamie Lee Curtis, Mark Harmon, Martin Kove, George O' Hanlon, Jr. In the late 1920s, Edward Stratemeyer became the man behind a large library of juvenile fiction that would be read by generations to come, including the creation of such characters as persistent teen sleuths the Hardy Boys and Nancy Drew. While there is some historical inconsistencies as to what he actually wrote versus "produced", it is Stratemeyer who often gets the credit, not the ghostwriters; Mildred Wirt Benson, however is generally considered to be the official Nancy Drew author Caroyln Keene, while Leslie McFarlane gets the nod as the principal Hardy Boys scribe Franklin Dixon. But all that who's who stuff mattered little to the children who read the books, and as one of those weaned on those blue hardcover Hardy Boys mysteries I can attest that my only concern was getting my mitts on another installment, and not who wrote it. This two-disc set of the 1977 television series has all 14 season one episodes, and the show tried hard to capture the innocent magic of those wonderful books by offering a one-hour mystery, alternating each week between the Hardy Boys and Nancy Drew. In keeping with the general spirit of the books, the plots centered around vaguely supernatural themes, though invariably things are not quite what they seem, and the culprit is exposed in the final minutes thanks to some diligent teen snooping and the application of good ol' logic and reason. An odd assortment of directors—Jack Arnold (The Creature From The Black Lagoon), Ivan Dixon (Kinch from Hogan's Heroes), Andy Sidaris (Malibu Express)—are spread across season one, but the cookie-cutter structure of the show is such that they all could have been made by the same person and no one would be the wiser. I don't get the same level of page-turning excitement in the series that I had with the books, and the one-hour format of the show carried the usual limitations, and the mysteries had to get condensed a bit to fit correctly. There is a rather clockwork-like progress to things, and the level of durable small screen acting (filled with familiar television faces like William Schallert, Monte Markham and Gordon Jump) is offset by the occasional guest star, such as Rick Nelson or Bob Crane, or the presence of soon-to-be-stars like Jamie Lee Curtis or Mark Harmon. The unmistakable veneer of wide-collared 1970s fashions permeates these 14 episodes, making them either oddly curious artifacts or warm and fuzzy memories, depending on your age. For me, something is missing, and the allure of the books just doesn't translate that well here. Casting caused a bit of a stir, with teen idol Shaun Cassidy and Parker Stevenson taking on the roles of Joe and Frank Hardy, in part because I believe no readers of the books imagined them as both having such rich, luxurious hair. 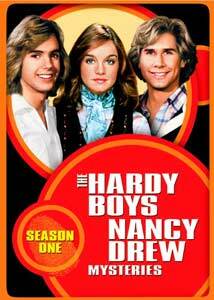 As a 17-year-old in 1977, I was a bit past the demographic curve when this series originally aired, but the knowledge that pretty boy Cassidy had been cast as one of the Hardy Boys was enough to certainly make me run far away, though I do recall watching a few episodes out of a burning curiosity. The fact that producers used it to present a convenient opportunity for Cassidy to sing his hit single Da-Do-Run-Run really seemed to tarnish those golden memories I had of the Hardy Boys. Pamela Sue Martin, on the other hand, was a blandly fine choice as Nancy Drew, being properly cute and smart at the same time, though the success of her character never achieved the same teen cachet as Cassidy and Stevenson, which was reinforced at the start of season two. At that time the premise of alternating weekly episodes between the Hardy Boys and Nancy Drew changed, and the two became more intertwined, though here on this set it's an either or situation. To blur that point slightly, Universal's packaging puts the seven Hardy Boys eps on one two-sided disc, while Nancy Drew gets the same treatment for her mysteries on disc two. What that does, for purists, is put the episodes out of original air date sequence, though there is no real continuing story arc between them. So I guess it's really a moot point unless you obsess about this kind of thing. Image Transfer Review: The 14 episodes are presented in their original 1.33:1 aspect ratio, and all deliver fairly decent color reproduction, at least when a scene takes place in daylight. Night scenes or dim interiors look a little too dark, and the veil of fine grain that is present throughout just aggravates the situation when lighting is less than perfect. The prints are free of any major physical flaws, such as nicks or scratches. Audio Transfer Review: Audio is provided in a slightly tinny Dolby Digital 2.0 mix, though it is more than adequate in presenting the clue-filled dialogue clearly and without any apparent hiss. Not a particularly exciting audio presentation, but certainly acceptable for mid-1970s television. Extras Review: There's two amaray cases, a cardboard slipcase, but not much else. A small foldout poster of Cassidy and Stevenson from a back-in-the-day cover of Dynamite Magazine is provided, but where's the equal time for Pamela Sue Martin? There is, however, a Play All option available for those in the mood for a marathon. Each episode is cut into four chapters, and includes optional subtitles in English, French or Spanish. If this show held a soft spot for you, then this two-disc season one set will probably bring back some fond memories. As a fan of the books, the sparkle just isn't here for me, and I just can't see this as anything but by-the-numbers episodic television. If you've got kids in your house, take them to the library and pick up the books instead.